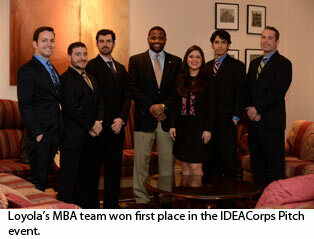 The Loyola University New Orleans MBA team won big for its client this year at the New Orleans Entrepreneur Week. In addition to winning first place Friday, March 28 for the IDEACorps Pitch event, the Loyola IDEACorps team offered Cajun Fire Brewery, a locally owned and operated New Orleans-based craft brewery startup, pitch prep that helped the entrepreneurs win one year of free legal services from Chaffe McCall. But the most prestigious (and financially significant) prize came when Cajun Fire won the Big Idea event, which came with a $50,000 seed grant to help move its craft brewing operation to commercial scale. An independent craft brewery, Cajun Fire produces ales inspired by local flavors, including its Acadiana Honey Ale and Praline Ale. The company is the second locally owned brewery in Orleans Parish and only the third African American-owned brewery in the U.S. The Loyola team worked with Cajun Fire to evaluate its business plan and prioritize tasks to help the company expand its business. For Cajun Fire to increase local awareness and expand production processes, the team recommended focusing on local markets and promoting Cajun Fire’s top two flavors. The Loyola IDEACorps team also won the 2014 Impact Award from Idea Village on Friday morning, beating out heavy competition from the University of California at Berkeley, the University of Chicago, Cornell University, the University of Pennsylvania and Tulane University. Loyola’s team included Kevin Gordon (team leader), Michael Barrera, Melissa Gurdian, Ryan Murphy, William Mather, and Nicholas Hanson. Felipe Massa, Ph.D., served as faculty adviser for the team.